We now accept payments through PayCargo! At Galasso Trucking, a professional company with dependable service, we share one goal...a commitment to quality service for our customers. 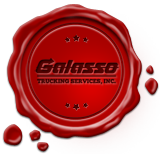 Galasso Trucking was started in January of 1975. As I look back over the past 40 years, I remember that I promised to give our customers the best service. As you know, in our business, experience counts - the more quality work we do, the more we learn about our customer's needs and how to serve them best. In order to maintain our customer's confidence, we must be responsive in providing consistent and flexible serivce. Over 40 years in business proves that we're reliable. When you call us, you are greeted with personalized serivce and when your shipment is ready for pick up or delivery, it will be handled by our courteous, professional drivers. Galasso Trucking can meet your every need. Please take a moment to review our website, then allow us an opportunity to meet with you to show you what Galasso Trucking Service, "The Performance Carrier" can do for you. Copyright © 2012 - All Rights Reserved - Galasso Trucking, Inc.